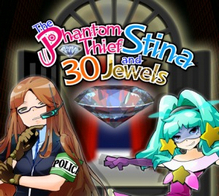 The Phantom Thief Stina and 30 Jewels was delisted from the Nintendo 3DS eShop in North America in May of 2018. According to a Wikipedia discussion started by user Kristie Ann Webb this is when several 3DS titles published by Agetec were removed from the eShop. Many of these titles remain available in Europe as of this writing where they were also published by Agetec. “Target! Infiltrate! Steal! Sneak pass the guards, bypass the security codes and experience the rush of stealing the jewels. The year is 2120, and humanoid robot helpers are commonplace, even among thieves. Not that the Phantom Thief Stina is a commonplace thief! This self-proclaimed artiste and her pack of burglar bots are taking on Detective Sara and her robotic security team in an epic battle of wits! Heist all 30 jewels to complete the game and unlock the detective mode. Play as detective Sara and deploy her robotic security team to protect the jewels against the Phantom Thief. Are you able to protect the jewels against the Phantom Thief? Play as the hero and villain!